Ballater's HM Sheridan's pull off a unique double in adding the Best Speciality Pie to their Best Traditional Steak Pie Championship. 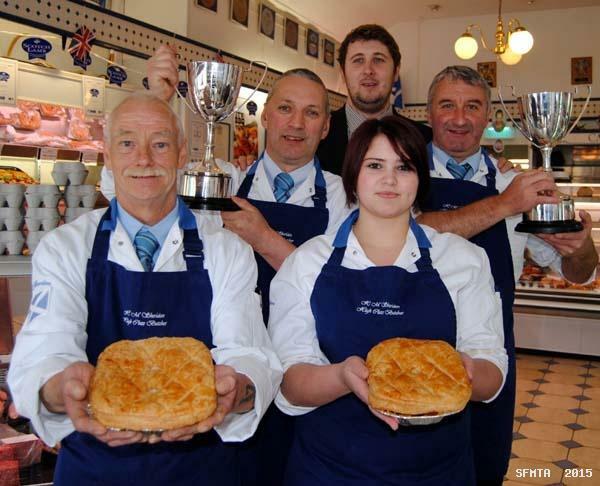 Cranberry was the special ingredient that ensured a Venison Pie from Ballater butcher HM Sheridan savoured sweet success in this year’s Scottish Butchers Speciality Pie Competition. When the 2011 winners were announced it was revealed that their Venison and Cranberry Pie had taken not just the imagination of the judges but their palates too. John Sinclair and Barry Florence of Sheridans were presented with the trophy and prize by David Mooney, Wm Sword Ltd in their shop at Bridge Street, Ballater on Wednesday 31 August 2011.